Governor McCrory and other officials had said recently that a repeal of HB2 might be possible, but the Charlotte Ordinance would have to be repealed first. Any chance of that happening was killed by both North Carolina State lawmaker Becky Carney (Mecklenburg) and Mayor Roberts. Carney, a Democrat, killed the attempt to repeal the illegal Charlotte Ordinance as part of a compromise related to a possibly repeal House Bill 2 (HB2). What’s more, Carney’s maneuvering has exposed the use of HB2 as political leverage by Democrats. A Democratic member of the legislature, who spoke on background to discuss the situation, confirmed Carney tied her opposition to the ordinance’s repeal directly to her desire to keep HB2 on the books so Democrats in close legislative races could use the bill as a wedge issue in November’s election. The lawmaker said Republican leaders in the legislature had agreed to repeal HB2 if the city’s ordinance were also repealed and that there were enough votes to push the bill’s repeal through. Carney isn’t the only one using HB2 as a political campaign tool. The most visible candidate using HB2 to leverage his campaign is Attorney General Roy Cooper, who is challenging Governor Pat McCrory. Campaign finance reports show Carney received only two donations in the second quarter, $500 each from the Bank of American PAC and the Wells Fargo Good Government Fund. The CEO’s of Bank of America and Wells Fargo have both publicly opposed HB2. 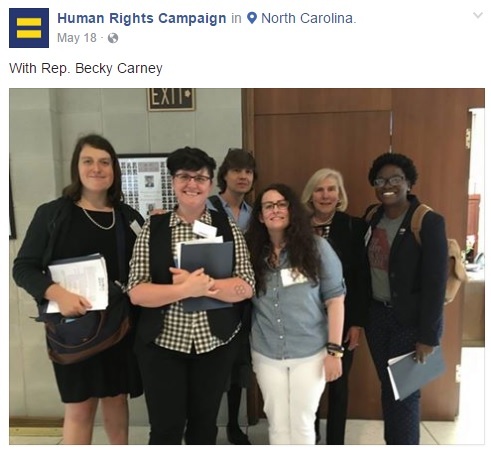 This past May, Carney was one of the legislators who met with Equality NC and Human Rights Campaign activists during a lobbying visit to repeal HB2. Mayor Roberts gave a statement yesterday from a podium bearing the logos of Equality NC and the Human Rights Campaign. Both of organizations are alleged to have helped craft the Charlotte Ordinance and have engaged in attempts to economically blackmail the state into repealing HB2. Standing just to the right of Mayor Roberts in the grey suit is Chris Sgro who was appointed to fill an empty North Carolina General Assembly seat back in April. Sgro is also the Executive Director of Equality NC. It has been noted by this site that Sgro has engaged in fundraising activities for Equality NC despite resigning his lobbying position for Equality NC. These fundraising efforts are to fund opposition of HB2 and represent a conflict of interest between the two positions Sgro currently holds. In August, an ethics complaint was filed against Sgro for these activities. This entry was posted in Campaign 2016, ELECTIONS, LGBT, LL1885, Pat McCrory, Social Justice, The Articles, You Will Be Made To Care and tagged Becky Carney, Charlotte Ordinance, HB2, Mayor Roberts. Bookmark the permalink. If the governor refuses to repeal a bad law until Charlotte repeals it’s good one, then the person holding back the repeal of the law is the governor. The Charlotte Ordinance was illegal and it was not a “law”. Charlotte’s ordinance is not good law. It’s an illegal local ordinance that is outside the authority granted to cities by the state legislature, it violates private property rights, and puts the safety and privacy of citizens at risk. HB2 would not exist were it not for the Charlotte ordinance. It cannot be repealed without the prior repeal of Charlotte ordinance #7056. Also, HB2 is consistent with federal non-discrimination law. Mayor Roberts…stop making a mockery of the great North State. How you got elected, I’ll never know, but we are conservative, mannerly, God fearing Christians. I applaud Govenor McCrory’s stand. I do not want to use the same rest room or locker facility as a man who thinks he is a woman. It is all about common sense. Repeal your “law”. It is the right thing to do. By the way, were the citizens you “represent” given any say so in this highly ridiculous matter???? Roy Cooper is such a timid but EVIL individual who is an ENEMY of our state! Ditto Becky Carney. Make it a point to tell every democrackkk you know just how much you blame them!